One of the most followed people on Instagram had also one of the most difficult years. In September, Selena Gomez announced to her 144 million followers that she was taking a break from the platform to live more in the moment. The post, which included a smiling photo of Selena, received over 8 million likes and is littered with comments asking for her to return. One of the most followed people on Instagram had also one of the most difficult years. In September, Selena Gomez announced to her 144 million followers that she was taking a break from the platform to live more in the moment. The post, which included a smiling photo of Selena, received over 8 million likes and is littered with comments asking for her to return. Did Justin cause a breakdown? 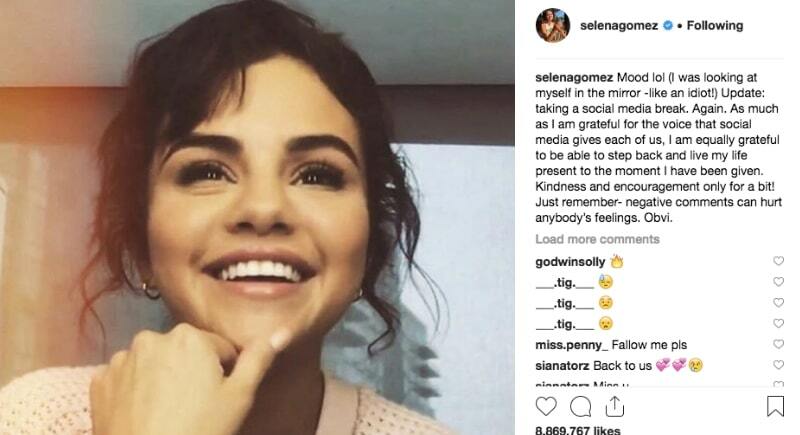 It’s not the first break from social media for Selena, following her complications from Lupus and a subsequent kidney transplant (donated by her close friend) the singer noted that due to anxiety and panic attacks related to her condition she needed to sign off. Again in September 2018, Selena was reportedly hospitalized for low white blood cell count and suffered a breakdown, and signed off social media to recover. No doubt her first love, Justin Beiber’s very public romance, and quick marriage to Hailey Baldwin aren’t helping matters. Wishing Selena all the best and we hope to see her back in the spotlight when she’s healthy and ready.